Hollywood Video. Larger-than-life murals... 1989-1994. 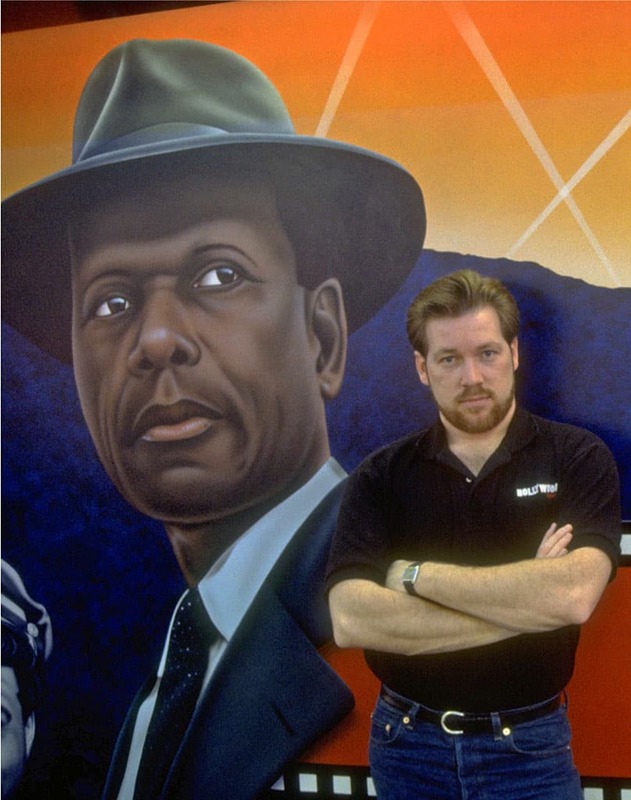 During my time as Hollywood Video’s creative director and resident artist, from 1989 to 1994, I created over a hundred hand-painted wall murals – most measuring upwards of ten feet tall and eight, ten and sometimes 20 feet across. The pace was a fast and furious and it was a hugely creative time for me. We were opening a new store every month and all the murals were hand-painted, so I worked both day and night, painting often until the early hours of the morning. Then, after only a short break I would get back in the studio and start all over again. It was prolific experience that helped make me the artist that I am today. 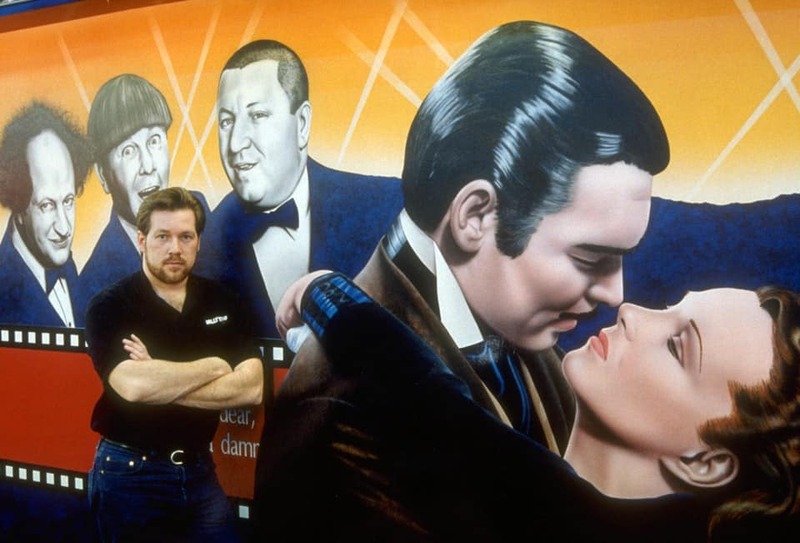 A.D. with the “Three Stooges and Rhett & Scarlett” wall mural at the Lake Oswego, Oregon store, circa 1991. Originally, all my murals were painted on location on the store walls. The Three Stooges, Rhett and Scarlett from Gone with the Wind, and Sidney Poitier were hand panted as one large mural measuring approximately 9′ tall x 22′ wide. Not shown here, but also in the mural were Jackie Gleason (To the moon Alice), and Clint Eastwood as Dirty Harry. I started this mural during the construction phase of the Lake Oswego store and completed it, along with a few other murals and graphics about a couple weeks after the store opened for business. “Mr. Tibbs” (aka Sidney Poitier) – part of the same mural as the “Three Stooges and Rhett & Scarlett” above. Terminator, approx. 10 ft. tall, painted on location at the Vancouver, Washington location, 1989. The Terminator (above) was actually one of my first murals for Hollywood Video, which I painted at the Vancouver, Washington location. The Vancouver store was the very first HV location. I had painted several murals there, but we worked long hours I neglected to take pictures back then. Overall, I painted around 1,400 square feet of murals at that store, including Rambo, Frankenstein along with his bride of Frankenstein, Teenage Ninja Turtles and a plethora of other obscure movie references. I went on to paint murals in several other locations: Kelso, Washington… Tigard, Beaverton/Hillsdale, and Lake Oswego, Oregon, along with a few other locations before we realized that it was best to set up a studio in and paint the murals on stretched canvas. The canvas murals were then installed at the stores rather than painted on location. That allowed me to be in the new store for a day or two instead of a month. From that point on I created all my murals in the studio as large paintings on canvas. Over the years I painted many movie stars and celebrities; John Wayne, Elvis, Bogart, Schwarzenegger… If they were hot on the screen they were subject for my art. One of my all-time favorite movie stars to paint was Marilyn Monroe. I must have painted her iconic imagery a dozen times – maybe more. “Marilyn Monroe” on canvas, approx. 9-1/2 ft. tall, created for the Lynnwood, Washington store, 1992. “Total Recall” on canvas, approx. 9-1/2 ft. tall, created for the Salem, Oregon location, 1992. Later, as stores opened more frequently, my hand-painted murals were photographed with an 8 x 10 view camera and reproduced as photo-murals, which were installed in numerous Hollywood Video locations throughout the United States. “Humphrey Bogart”, approx. 9-1/2 ft. tall, created for the Salem, Oregon store, 1992. “Starring Steve Martin” on canvas – 93” tall x 95” wide, 1993. 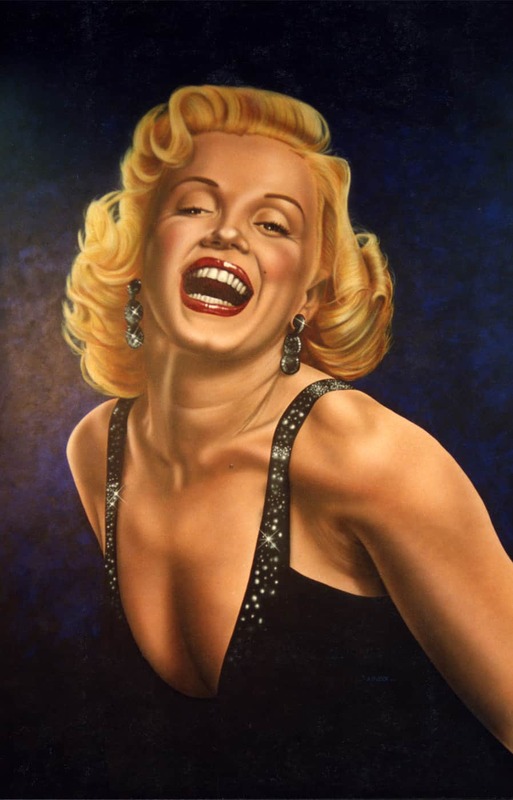 “Starring Steve Martin” and “Marilyn Monroe” (below) were created as a diptych/two-piece mural, and were awarded first place in the Airbrush Action 7th Annual Airbrush Excellence Competition in 1993, Mural Category. Both original paintings were displayed together at the Beaverton, Oregon location until it’s closing – at which time I rescued and archived them until 2011. Both murals, along with the “Elvis & John Wayne” mural are currently on display in private residence, Las Vegas, Nevada. “Marilyn Monroe” (sepia tones) on canvas – 93-1/2” tall x 71” wide, 1993. “Elvis & John Wayne” on canvas – 114-3/4″ tall x 153″ wide, 1993. “T-Rex” on canvas – 115-1/2″ tall x 139-1/2″ wide, 1993. My T-Rex mural was featured in an article… “Airbrush Large Scale Painting / Interior Super Murals” by Kurt Sinner, published in Airbrush Magazine vol. 2.3, 1995 and Airbrush Action 3, The Best New Airbrush Illustration by Airbrush Action magazine, along with murals I created of Elvis, E.T. (the Extraterrestrial), Eddie Murphy, and the starship Enterprise (below). “Star Trek Enterprise” on canvas – 110-1/2″ tall x 167-3/4″ wide, 1993. The murals shown here represent only a small sampling from the many I created for the Hollywood Video stores over the five years I was with them. I was young then (28-33 years old) and had no shortage of energy. I was filled with a passion to paint. And that I did, sometimes creating a mural a week, often painting two or three at any given time in my studio. Recently, I was inspired to pull a couple of the remaining murals out, unroll them, and enjoy a moment of retrospection. It was the first time I had the opportunity to view them since I painted them in 1993. A selection of the original paintings have been in archive since then – rolled up and stored away safely. Over the last couple decades, many of the canvas murals were damaged or lost as stores opened and closed. The ones painted in the stores have since been painted over. In most cases, the images above are all that remain. 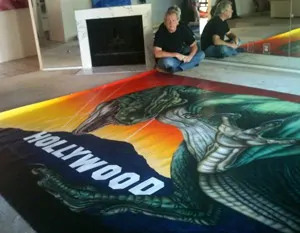 Of the canvas series, only a few of the original Hollywood Video murals exist today. And of those, only a very select few remain intact and are available to serious collectors. Click here to read “Airbrush Large Scale Painting / Interior Super Murals” — Story by Kurt Sinner, published in Airbrush Magazine vol. 2.3, 1995.